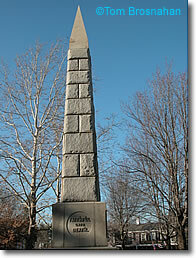 The small park at the center of historic Concord MA takes its name from this obelisk raised to the small town's men who fought and died in the Civil War (1861-1865). Many prominent Concordians (Emerson, Thoreau, the Alcotts) were staunchly anti-slavery before it was easy to be so. 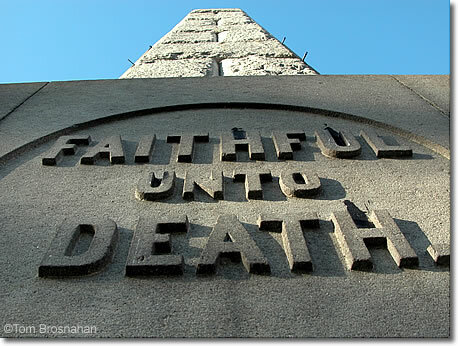 For such a peaceful place, Concord has given a surprisingly large number of its sons and daughters to the service of their country. Monument Square (map) is surrounded by important buildings: the Town House (Town Hall), the Colonial Inn, three churches and rectory, the historic Wright Tavern, and offices.